I wouldn't worry about the nib collar at all, I'd much rather focus on the nib. There is quite a variance among the vintage Pelikan nibs in my experience but they are all outstanding writers. Some of the 400NN nibs are particularly flexible. But most of my Pelikans have less flex than my Osmias or Kawecos of the same time. On the other side, they are less finicky to write with. The easiest way to have some mild line variation without any effort is to get an OM nib. Oblique nibs were very common in Germany, so they are widely available. I don't have a suggestion for a particular ink. It's just such a matter of taste. But be assured that the old Pelikans can cope with practically any common ink. These are the pens which give me the least trouble with critical inks and lousy paper. The war CN nibs are said by many to be semi-flex at least or better superflex...........mine was and is regular flex.... . Sometimes I wonder if the poster knows the difference....after all regular flex the nib bends and has tine spread. For the longest time, I spoke of regular flex...that was normal issue of new pens back in B&W TV days...............nobody seems to know about it today. Pelikan 200, the '82-97 Pelikan 400's and the W.Germany to '97 600 were regular flex.....Esterbrook, Wearever and Sheaffer had pens with that normal issue flex...............Those with Japanese pens know regular flex as 'soft'. There has been some that thought regular flex was semi-flex because the tines bent and spread. War CN nibs said nothing....or I'd told the guy I bought the CN nib to make sure it was at least semi-flex. Mine was regular flex.... ....when all that had such nibs raved about them....I was expecting maxi-semi-flex or superflex........................not regular flex. They made that nib in at least two flexes. A while back and even now to many in the States, semi-flex is/was rare...so perhaps they didn't know the difference between regular flex and semi-flex. Regular flex has become rare in our modern vocabulary. Pelikan Steno nibs...........was always on the com...superflex. A pal in England I trans-mailed, in some folks in Germany trust only German post office, refuse to mail outside of Germany, so I trans-mailed. 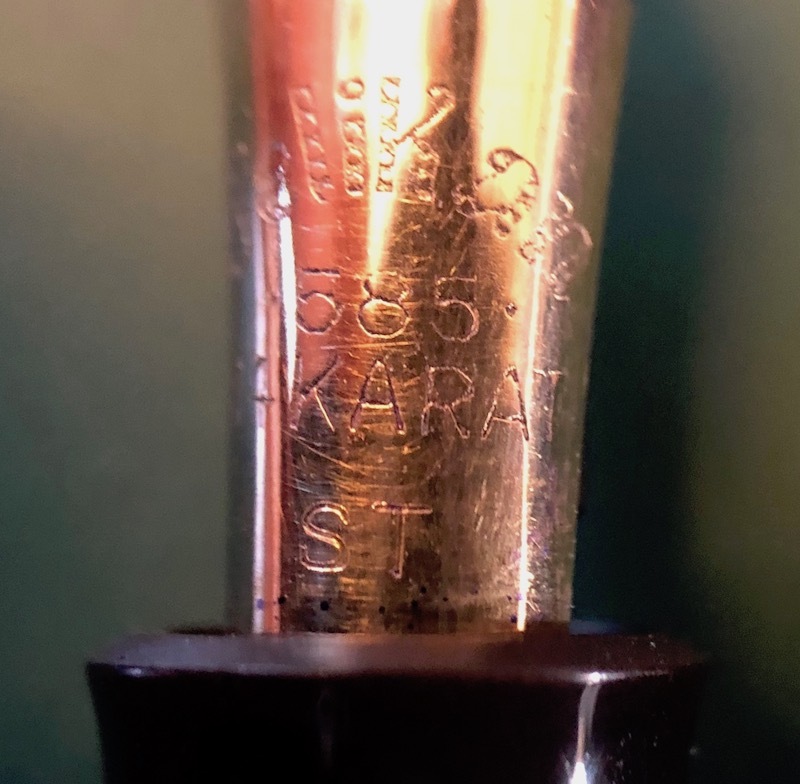 A Pelikan Steno nib came to me for trans-mailing.....and it was not the superflex that everyone indicated they were.....but only regular flex......not even the semi-flex so common in that era. So do take care and mail questions when you buy, so you can send the CN or Steno nib back for not having enough flex as you thought by your reading it would have. 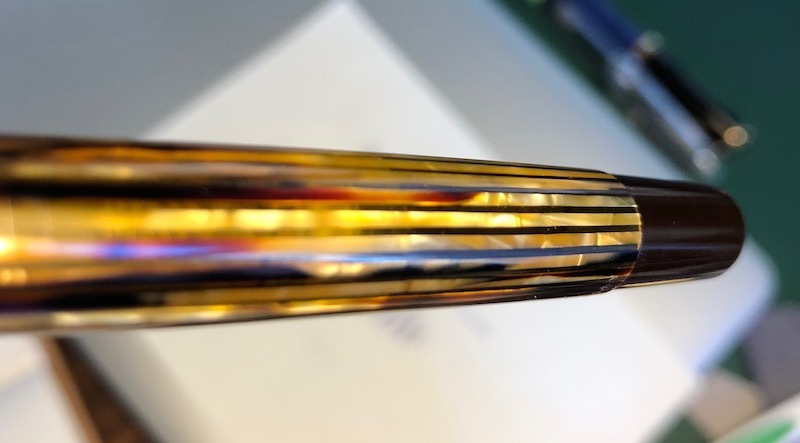 Do remember many sellers don't know what semi-flex is much less superflex. 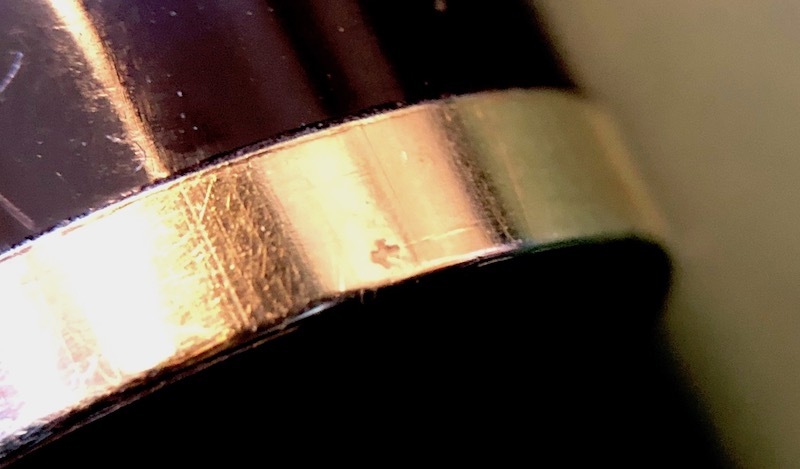 Be aware some think semi-flex is a flex nib. After all...flex is in the name. Edited by Bo Bo Olson, 15 March 2019 - 21:15. I'd highly recommend Pelikan Blue/Black. It's an ink that really compensates for the fire-hose writer that you'll be receiving. Vintage Pelikans are not fire hose writers unless somebody tweaked the nib. Thank you for your detailed suggestion and sharing your experience. Then i will buy Pelikan 4001 Blue/Black ink for my first pen. I also need a second ink as i am going to buy two pens. 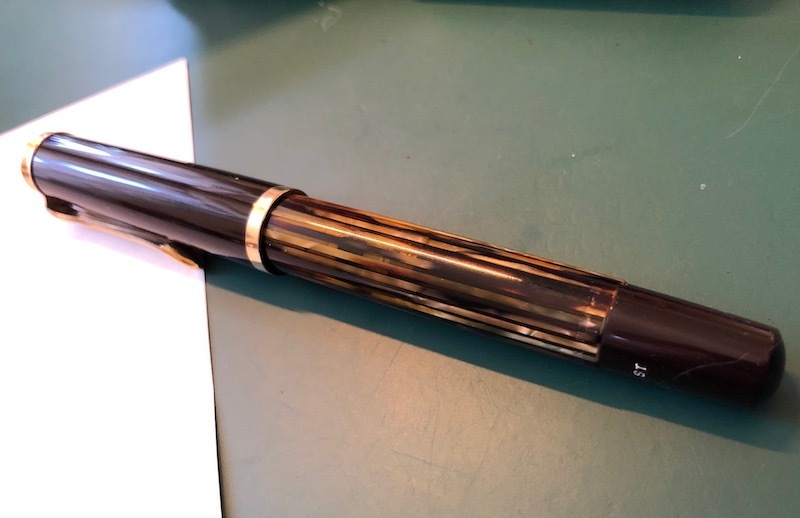 Can you recommend a good brown color ink for my second pen? Edited by dinupravin, 16 March 2019 - 03:20. 4001 blue-black is a world classic. I do not collect blue black ink.................and I don't know how or why I have seven different ones of them. Herbin Lie de Thee` is a tea brown ink....for @ E10 (small bottle).............now that MB is asking E19 for it's normal shoe inks, I'll not be buying anymore, Toffee. Both are shading inks. Shading inks require 90g copy paper, laser paper would be better. Pelikan's Edelsteine inks, Smoky Quartz, E16, a nice brownish ink. Similar to Lie de Thee`. Fancy bottle. No Ink Jet paper, that feathers because it has to absorb ink fast. Laser-Ink Jet paper is a compromise. Look for a laser only paper. What will the second pen be? I am by no means an expert on brown inks, but the one that I plan on buying soon would be Rohrer and Klinger Sepia. 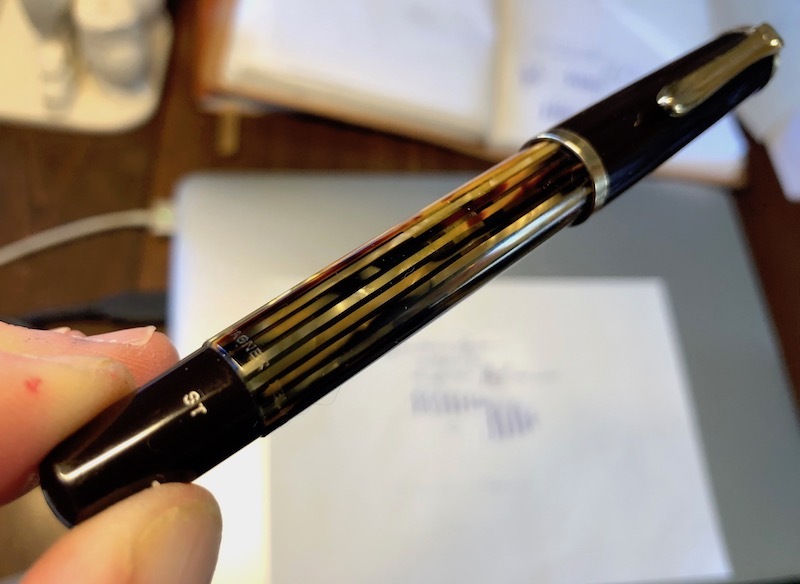 I have also heard good things about Waterman Absolute Brown, but I think others can chime in. Personally, I am fairly paranoid about my pens, so I choose from well-established companies that have little to no problems reported. I am sure that Pelikan, R&K, and Waterman fit the bill, as well as Diamine, Pilot and many others. If ya use crappy paper like me, than I have also heard good things about Pelikan 4001 Brilliant Brown. Drier inks, IMHO, go along very well with Pelikans because they work on all types of papers. I can't even say that for Waterman inks, (which are known to be the safest inks out there, yet I find them too wet for my 140). I am going to go for Pelikan 4001 Brilliant Brown. Thanks for your suggestions. I, too, use both the Herbin Lie De Tie & Edelstein Smoky Quartz in my Tortoise Pelikan 400. I am very happy with them both. Edited by Seney724, 17 March 2019 - 20:27. I am thinking of that ink too. Edited by Spelikan, 23 March 2019 - 18:00. 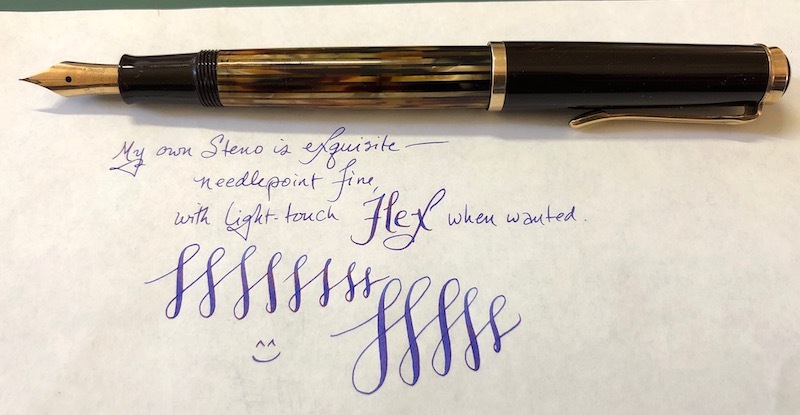 ST is a steno nib...............that one shows superflex. I had one pass through my hands, trans-mailing it for a pal in England in some Idiots in Germany refuse to ship out of Germany............it though was only regular flex not super flex. I was happy it was not mine.